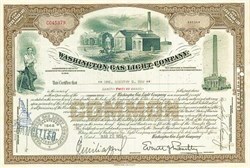 Beautifully engraved certificate from the Washington Gas Light Company issued in 1956. 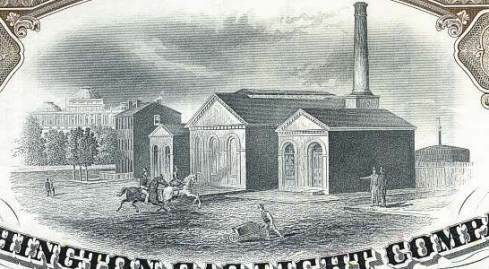 This historic document was printed by the American Bank Note Company and has an ornate border around it with a vignette of the first Gas Light Plant, a blacksmith and a memorial. This item has the printed signatures of the Company's President and Secretary and is over 48 years old. Washington Gas Light Company provides natural gas services to metropolitan Washington, D.C. and adjoining areas in Maryland and Virginia. 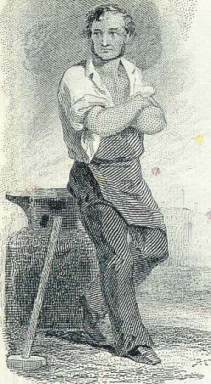 The company through a distribution subsidiary serves portions of Virginia and West Virginia. The operations of the company are carried through four wholly owned subsidiaries - Shenandaoh Gas company, Crab Run Gas company and Hampshire Gas company and Washington Gas Resource Corp. Shenandoah Gas Company distributes and sells netural gas under retail trade in the Shenandoah valley, Crab Run Gas Company explores and produces natural gas, Hampshire Gas Company operates an underground gas storage facility. Washington Gas Resources Corp is a non-utility subsidiary which provides appliance inspection services, for both gas and electric appliances under the company's certified performance program. Regulated utility accounted for 87% of revenues; energy marketing, 9%; heating ventilating & air conditioning, 3% and customer financing and other activities 1%.